1. First thing you do early in the morning? Curse at the alarm and reluctantly get up to turn it off, only to stumble into the bathroom to shave and shower. 2. If you were trapped on an island, which pen and ink would you take with you? And, why? Hmmm, I really like the new formulation of the Monteverde USA inks, and California Teal really stands out. 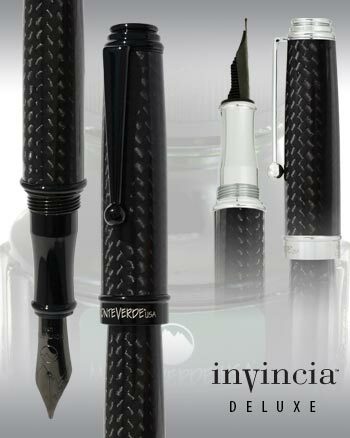 As for the pen, I will go a little sentimental and pick my Monteverde USA Invincia Deluxe. It was the first pen I bought that was more than $20. After I wrote with it I was really impressed, and it opened the flood gates to my pen passion. 3. Who would you say is your number one pen inspiration? I am going to say Azizah with Gourmet Pens. She has a passion for pens, ink and paper and it really shows. I like how she is just making content from playing around with her pens and practicing handwriting. It is refreshing to see the fun and exuberance. 4. What made you decide to start using fountain pens? I am obsessed with office products and the stores that sell them. I had always seen fountain pens on television or read about them, but they were none available where I grew up. One day, as I was perusing Staples, I came across a display of inexpensive Cross fountain pens. I decided this was my chance to finally give one a try and see what the fuss was all about. As soon as I wrote with it, I was hooked. The writing experience alone is what snagged me to completely fall down the rabbit hole. 5. Do you remember your first pen memory? Cartoons from the old days. I grew up with Tom and Jerry, Looney Tunes, and older cartoons, and there would always be a moment where an old lever filler-based fountain pen would be used as a weapon. A defiant stance and the pulling up of the lever made the antagonist stop as they were greeted with a hose-like force of ink. 6. How many pens and inks do you have? Hmmm, I currently have approximately 100 bottles of ink and approximately 150 ink samples. My pen count is approximately 60 pens, at least for now. Right now, Monteverde USA Olivine is one of my favorites. It shades nicely, has great saturation and flows nice and wet. I can’t really say I have a favorite pen over all the pens out there. However, I am inspired by classics. Conklin was one of the American Big 4 pen companies back in the day. I really enjoyed their filling mechanisms. 8. Latest ink color you are using? 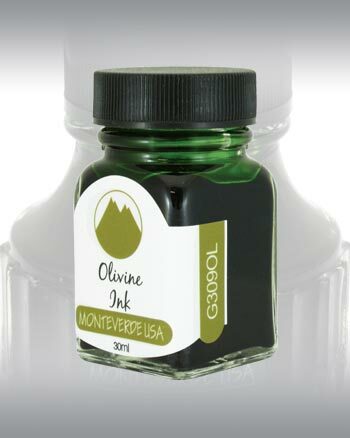 I am currently using Monteverde USA Olivine as I love green (favorite color) and it is an amazing value compared to the others. The new ink formulation has great shading, saturation, flow and is very well behaved. Coffee with added espresso for that much needed punch to the face in the morning. I have an appreciation for both, but journaling wins out. 11. Life philosophy you live by. Accepting people for who they are. I don’t care about race, creed, or sexual disposition. We are all human beings and should be treated as such. 12. Which pen and ink color would you like to get next? I want to test the Monteverde USA Noir ink set. Those colors are super intriguing and interesting. Why get one color when you can get 10? For the pen, I am very enamored by the Stipula Tocco Ferro with a broad point. It is a great looking design and I do enjoy heavier pens. 13. What are your favorite pen accounts on Instagram? 14. Any pen – ink trouble shooting tips? Oddly, it seems simple but I fall victim to this more than I care to admit. If you uncap a pen and try to write, but the nib just isn’t putting in to the page. Unscrew the barrel and check the ink level first. You may need to refill. 15. What color ink would you never get and why? Bright Pink. It is just not a practical color choice for me and it is always a tad hard to read. 16. Does your pen describe your personality? I would say so. I carry inked pens with me every day and generally will pick the pen based off my particular mood that day or even time of day. All of the pens do have certain common threads and all of that stems from personal taste, style, and personality. 17. Would you close a $10M deal / contract with a $10 pen? If that is what I had with me at the time, yes. Otherwise, I would use a pen more fitting of the purpose. The opinions expressed in this product review are solely that of the author and are not endorsed by yafa.com. All rights reserved by the artist.